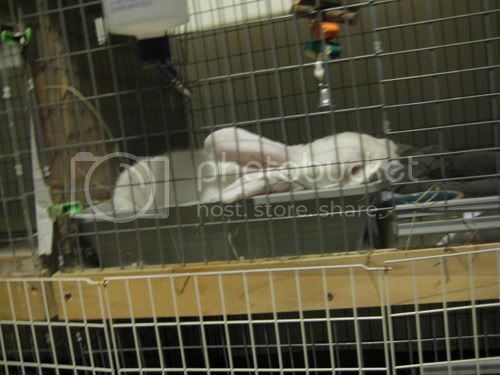 Moonie went to do some publicity and education at Especially For Pets in Wayland over the weekend. He had quite a few admirers — especially the women! It was a busy day at the store ($5 nail clipping day) and he was a bold champ. He had perfect litter habits, stared down 100lb+ dogs, and ran laps through his cardboard tube. he really was quite exhausted when he got home! 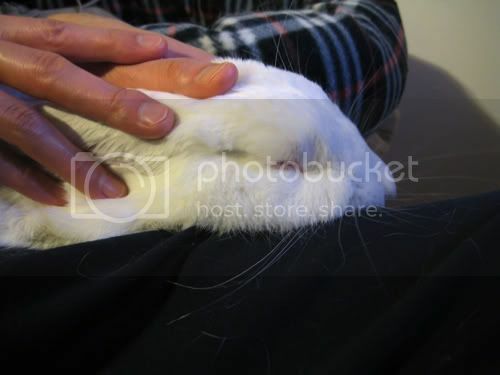 The next night, after a hard day of doing the bunny 500, racing through the tube, and binkying up a storm – here his is *again* – sleeping on my hubby’s lap – watching tv. Faith & McGraw – Come Watch Them Play! Many thanks to HRN foster mom, Lorna, for all her contributions to this blog post. Look at these gorgeous Flemish Giant buns. They are soooo cute! Since they are still youngsters, we expect them to get quite a bit larger. They both seem to have a laid back personality, which is true of many large buns, and love attention, especially being petted. 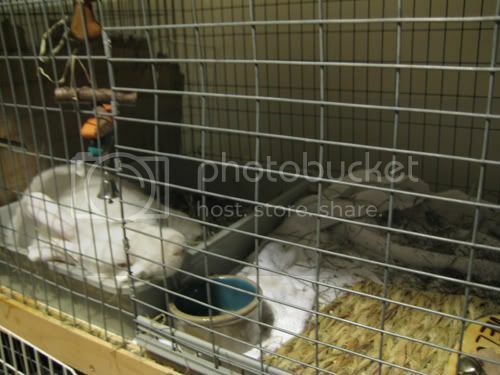 They would need a very large cage to live in, or better yet, an extra tall exercise pen to reside in (McGraw is a high jumper) or their own room. Their litter box habits could use some improvement, but again they are young. Faith & McGraw are hoping you will come by for a visit and decide that they are the buns for you! Please call the Hotline, 781-431-1211, to speak with an adoption counselor. Peek-a-Boo!!! Bridget Wants to Meet You!!! Special thanks go out to HRN foster parent, Shilpy, for all the help in putting this blog entry together. can pet her for hours, and she’s in heaven. she really loves her playtime! your hand in there, but otherwise everything is great! the Hotline,781-431-1211, to speak with an adoption counselor – thanks! Everything’s Coming Up Rosie !!! Comments Off on Everything’s Coming Up Rosie !!! All we can say about Rosie is “Don’t wait!”. If you are looking for a young bunny that is tons of fun plus a love, then Rosie is the bun for you! 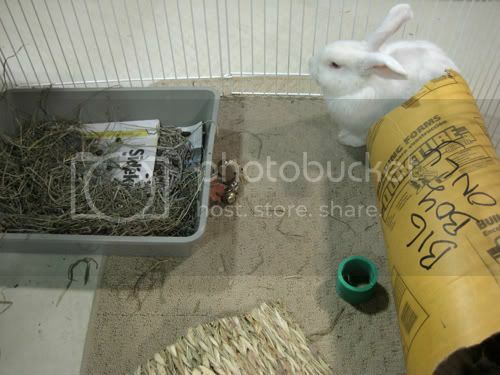 Once you open Rosie’s cage door, this outgoing bun in right there to greet you looking for a treat or some playtime. She easily scoops up into your arms and settles in for some pets, however do not expect her to be too patient for this adorable little girl has energy plus and is in a hurry to use it. One minute she will be scampering across the room, twirling around, showing off her binky prowess, the next she is playing mountain goat while trying to figure out how to get to the highest point in the area. Put a few toys out for her entertainment and she will delight you with her antics: tossing, nudging, chinning and digging! With her gloriously, thick, soft, gray fur, and her little white spotted nose and front paws, it will not be long before someone falls for her. So, do not wait! Come sweep Rosie away to your “Kasbah”, and she will surely make her new, forever loving home a very fun place to be! Call our hotline number, 781-431-1211, and arrange your visit with Rosie today!